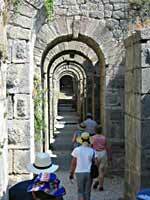 In the early afternoon we arrived at Pergamum. 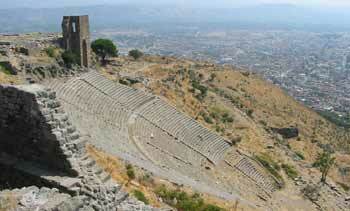 This was the location of an ancient Roman acropolis high above the town. The site stands at something like 380 metres above sea level and includes some spectacular views, a great acropolis and the world's steepest ancient theatre. Much of the site has actually been spirited away to museums in Germany, and only one third of the site has actually been excavated to date; there are still large sections covered by recent settlements which, at some point, will need to be pulled down to make way for the archeologists. We walked among the subterranean sections of the acropolis which showed off the load-bearing archways, and heard stories of lost treasures that may still be buried somewhere on site. In the theatre, we got a brief run-down on the usage of the venue from our guide for the day, Hursit (which was pronounced, to everyone's amusement, Her **it). 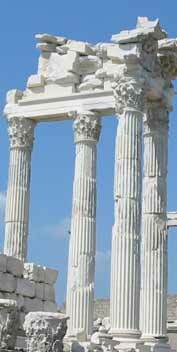 There was no permanent stage at Pergamum, as the area taken for this also served as a ceremonial gangway for a temple which sat at the base and to one side of the theatre. We then walked off about 1/3rd down the theatre and took a left. Realising that Hursit did not plan to take us all the way to the bottom of the theatre, I decided to run all the way down, grab a few photos, then run back up. The run back up slowed to a walk then almost a crawl as my thighs began to remind that this is the world's steepest ancient theatre and, by the way, it is also about 35 degrees centigrade. By the time I rejoined the group at the bus I was gasping for water and drank a litre almost without a pause. That was very thirsty work. Then began the long and not entirely comfortable drive down to Selçuk. This would be the longest journey so far. After a drive of approximately 6 hours (including brief comfort stops along the way), we were more than ready to check in to the Kalehan Hotel just outside of the town centre. The hotel had been described to us as 'interesting' and 'having character'. These are usually similes for 'ropey', 'ugly' or 'should be condemned'. Thankfully, this was not the case - Neil had also kept one ace up his sleeve as the hotel had a pool. On top of all this, we were to be staying two nights, so the suitcase could be more than just opened - we might be able to take some items out too. Ah, the novelty of it all. I went straight for the mini speakers and attached them to the portable CD player. Such extravagance. That evening, Manda and I skipped the group meal at the hotel, instead opting for a quick explore of the town centre. By the fountain that marks the start of the streets of carpet sellers (primarily), we had a meal of cheesy meatballs and pizza. It doesn't sound very Turkish, but let me tell you that I ordered them in the native tongue, if that makes it sound better. We were the only people eating at the restaurant, and naturally the guy was very attentive. We even got into a conversation (of sorts) with the carpet seller next door. Realising I was English he asked me what football team I support. I told him that I don't, to which he asked me again whether I am English. Does not support football team.